Direkt am Meer !! 25. bis 31. Mai verfügbar! Kostenlose Strandkorbeinrichtung inklusive! Kommen Sie und genießen Sie die schönsten Strände der Welt in unserer Summerhouse-Eigentumswohnung. Wir haben eine herrliche Aussicht von unserer Eigentumswohnung im 10. Stock! Unsere Wohnanlage ist geschmackvoll eingerichtet. Ständig gewartet und aufgerüstet, um Ihnen und Ihrer Familie den perfekten tropischen Urlaub zu sichern. Sie können die Meereswellen von Ihrem privaten Balkon aus genießen, der sich zum Wohnzimmer und zum großen Schlafzimmer öffnet. Unser Balkon bietet einen Blick auf die beiden Pools. Eines ist im Winter beheizt. Es gibt ein Kinderbecken, einen Whirlpool und einen Pavillon. Die Anlage ist sehr familienorientiert. In unserem Komplex gibt es Gasgrills und Picknicktische. Das Gerät bietet Platz für 8 Gäste. Es gibt zwei große Betten im Gästezimmer, ein Kingsize-Bett in der Master-Suite und ein ausziehbares Sofa im Wohnzimmer. Jedes Schlafzimmer verfügt über Kabel-TVs. 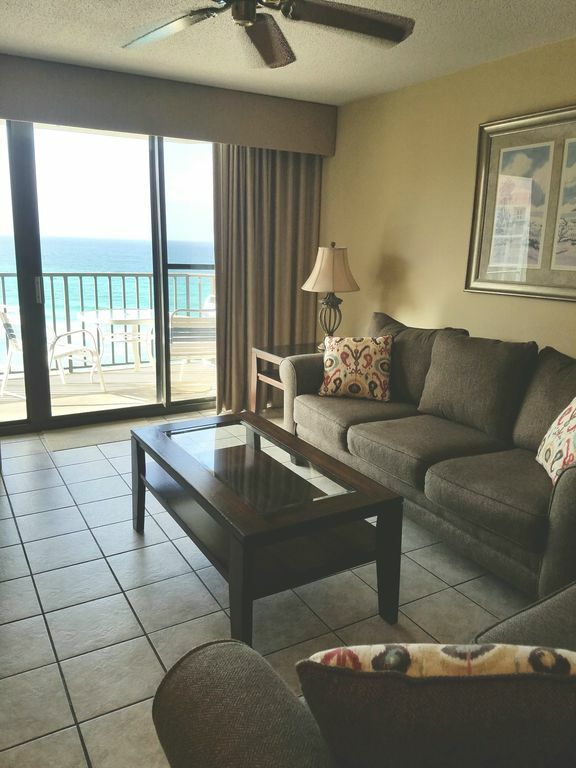 We spent less than 24 hours in the condo due to the mandatory evacuation for Hurricane Michael. Sarah called to check on us, let us know she was leaving Destin and that it would be a good idea for me to get gas soon as it was getting low there. Sarah then called back to let me know about the mandatory evac. She was very upset that we were not going to have our vacation. She assured me that she would "make it right" for me. She then called me the day after we had to leave to check and see that I made it home ok and to confirm my address to reimburse me. This is above and beyond excellent service. What little time we spent in the condo was great. It well furnished and the kitchen was well stocked. The view is awesome. I would definitely rent it again. Sarah is a super host and I pray that her condo didn't suffer any damage. She went above and beyond for someone she doesn't even know personally to advise me about the gas, to check on us to see that we made it home safely and to offer to work with me on reimbursement. It is great to know that there are still people in the world like Sarah. We loved the condo! Great view! We loved the condo the room was super nice! The elevator was a little slow and was out for several hours one day! Do not hesitate to rent this condo. Easy checkin. Loved the quiet location. Beautiful beach. Everything convenient. Be sure to take your hair dryer. I rented this condo for my best friend and I and our kids. We had 2 adults and 3 kids, and were comfortable. The condo has everything you will need to prepare meals. I loved that it was in the area that didn’t seem to be crowded, but everything is easy to get to! The views are great. I’d stay again. This condo was clean and right on the beach. Owner was very prompt with answers to any questions we had. Everything was low key while being close to other attractions. We are so glad you enjoyed your stay! Thank you for staying with us!